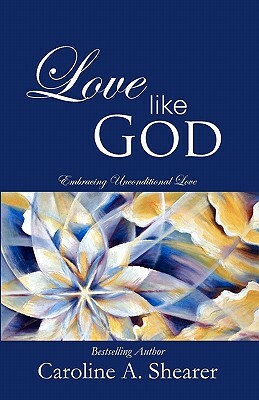 "Love Like God: Embracing Unconditional Love" will redefine your understanding of love. In this groundbreaking compilation, well-known individuals from across the globe share stories of how they learned to release the conditions that block absolute love. Along with the insights of bestselling author Caroline A. Shearer, readers will be reminded of their natural state of love and will begin to envision a world without fear or judgement or pain. Be Inspired ... To release blocks to loving yourself and others unconditionally To embrace every challenge as an opportunity for love To live without fear Along with Shearer's reflections and affirmations, experts, musicians, authors, professional athletes, and others shed light on the universal experiences of journeying the path of unconditional love. Readers will discover: That everything from autism to Alzheimer's can be a gift How international peace can be achieved What every husband should know How to deal with addictions, in our own lives and others' Why releasing blame creates freedom The most valuable lesson medical students, nurses, and social workers can learn Stories are from a wide-range of well-known individuals, including world-renowned musician Deva Premal; former international model Lorelei Shellist; Paramahamsa Nithyananda, a swami with millions of followers; bestselling author and Deepak Chopra-trained Crystal Dwyer; international peace promoter and voice on global terrorism Lisa Gibson; former professional baseball player Jon Graves; and Laura Stinchfield, the original "Pet Psychic." Contributors: Portia Berry Allen, K.L. and Tiffany Braxton Belvin, Jesse Birkey, Chase Block, Anicia Bragg, Kundan Chhabra, Robin Craig, Crystal Dwyer, Tonya Fitzpatrick, Esq., Vida Ghaffari, Lisa Gibson, Jon Graves, Gayle Gregory, Diana Y. Harris, Dana Heidkamp, Jennifer Hicks, Jennifer K. Hunt, Dr. Matthew B. James, Jacquie Jordan, Dr. Judy Kuriansky, Lori La Bey, Sharmen Lane, Nicole Lanning, Rick Lannoye, Katharine C. McCorkle, Ph.D., Shirley W. Mitchell, Kristen Moeller, Roy Nelson, Paramahamsa Nithyananda, Deva Premal, Claudio Reilsono, Dea Shandera and Brent N. Hunter, Lorelei Shellist, Dr. Joseph Shrand, Leesa Sklover, Ph.D., Cliff Snider, Laura Stinchfield, Gloria Tom Wing Staudt, Tom Von Deck, and Tom Wright. "Love Like God" sets the stage for a dramatic change in consciousness. Are you ready to redefine your understanding of love? Caroline A. Shearer is the founder of Absolute Love Publishing, which was born out of a mission to create and publish projects promoting goodness in the world. Known as a fresh, distinctive, spiritual voice, Caroline's visionary leadership is uplifting, gently blending love and inspiration. She is regularly featured as a luminary in print, broadcast, and online media, offering guidance and sharing positive stories of her personal spiritual journey toward a more abundant, joyful, and light-filled life. Intuitively guided, Caroline has a remarkable ability to unite others along a path of progressing and celebrating the experience of humanity. A bestselling author, Caroline's popular books include, "Dead End Date," the first book in the Adventures of a Lightworker metaphysical mystery series; "Love Like God: Embracing Unconditional Love;" "Love Like God Companion;" "Raise Your Vibration: Tips and Tools for a High-Frequency Life," a min-e-book, and "Women Will Save the World." In addition to her own projects, she founded Spirited Press, an assisted self-publishing imprint that operates under the umbrella of Absolute Love Publishing. Spirited Press supports authors in sharing their own messages with the world."